Eva Von Gronyitz, author of the scandalous, banned-in-Boston best seller "Valley of the Puppets", needs privacy while she writes the script for the film adaptation. Her agent goes to the Unique Employment Agency for help. Harry finds a safe haven for novelist, Eva, at Lucy's San Fernando Valley house. Lucy is to keep her away from fans and prying eyes so that she can complete the screenplay. As usual, Lucy takes her job very seriously much to the dismay of everyone around her. Special Notes: Eva Gabor best known as Lisa Douglas in Green Acres (1965-71) and Lucille work well together, both used to the broad style of comedy that is the hallmark of this series. Gabor also used the name Gronyitz as her maiden name in Green Acres. 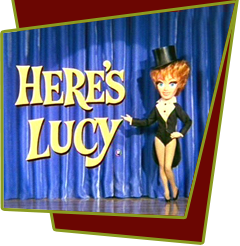 The name of Von Gronyitz' next book, Life with Lucille, is awfully close to the actual name of Lucy's final television series.